Place poblano chiles on medium-low heat grill, or on a baking sheet in a 450ÂºF oven. Listen for popping sounds, after about 5 minutes (on the grill), or about 10 minutes (oven). Turn the peppers so that all sides are charred. Once black and blistered on all sides, place chiles in a large bowl and cover with plastic wrap. This allows them to steam and makes for easy peeling. You don't want an overpowering sauce with these. I prefer a simple mild red chile sauce, or a good salsa verde. Some people prefer a simple tomato/onion/green chile sauce made in the blender and warmed. It's really your call. Run the chiles under cool water, and peel the charred skin. Make a lengthwise slice in each chile so that you can reach in remove seeds. This will also be how you stuff your pepper. Dredge each chile in flour, shaking off excess. Place back on baking sheet and into freezer. Beat the eggs. Heat the oil to medium-medium high (depending on your range), so that a pinch of flour begins to fry and create bubbles as soon as you drop it in. Place Panko crumbs in a large bowl or gallon-size plastic bag. Warm your sauce. By now, your flour-dredged, stuffed poblanos are ready to fry. Dip each one in beaten eggs, then roll in Panko crumbs, pressing lightly. Fry until golden on each side. Treat these gently with the tongs. The breading doesn't have a lot of 'glue'. 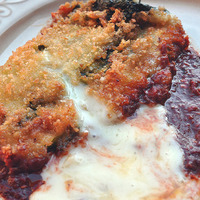 It's your dish, but I would strongly recommend plating the chile rellenos atop whatever sauce you choose. Why? For starters, you shouldn't conceal your accomplishment. Secondly, liquid turns crispy to soggy. This recipe is sufficient to serve 4-6 people, with a side of Mexican rice and sliced avocados.